Just put a bunch of sparkly, pretty things together and see what works. Start something and see what happens. 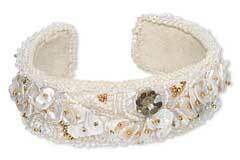 Seed beads and pearls and crystals. Sara's wedding inspired Sara's bracelet and the materials inspired the beaded fringe necklace. First, I started beading around the cabochon and the rest of the piece evolved from there. I was a cross-stitcher and a cross-stitch book was using beads instead of thread in a design and that started it. A woman I worked with at San Diego City Schools started making beaded ornaments and taught me how. 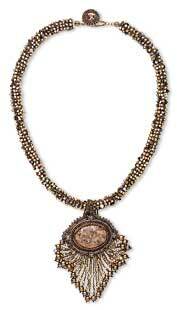 That with beaded cross-stitch started this cycle of jewelry making. Her name is Dorothy Hunter and we started a lunchtime beaders group that we called the ''Beady Bitties.'' We have all since retired. I discovered Fire Mountain Gems and Beads from the ad on the back of Bead and Button magazine. Other hobbies have fallen by the wayside except for recreational reading. I no longer belong to any beading societies or groups although there is a circle of friends in Gig Harbor, Washington that beads together when I can be there. I bead almost every day, it provides a term of therapy almost like meditation. It is not only a hobby but a part-time career. I enter contests, I teach at Gig Harbor Beads, Sacred Rocks RV Park in San Diego and privately. No I haven't. I'm not opposed to the idea, I just have not had the opportunity. Just start and worry about your masterpiece next week. View all of Phyllis's designs in the Gallery of Designs.